HERITAGE – Ethel Sarah Wolper is a cultural historian of the medieval and early modern Islamic World. Fraternity in Irak had the great pleasure to interview her about Mar Benham, the Syriac Catholic monastery of Northern Iraq partly destroyed by Daesh in March 2015. The reconstruction of the building is crucial not only for the region but also for its significance to many communities throughout the world. Ethel Sarah Wolper is a cultural historian of the medieval and early modern Islamic World. At the University of New Hampshire in the UK, she teaches courses on the history of Islam and the Middle East and Islamic art. 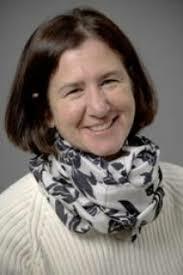 Read her biography on the UNH’s website. When were the current buildings of the octagonal mausoleum and the church of Mar Behnam built ? Mar Behnam was built and rebuilt over a considerable period of time. The general scholarly consensus, based on inscriptions and stylistic features, is that a large portion of the remaining church and mausoleum date to the medieval period, most likely during the twelfth and early thirteenth centuries. 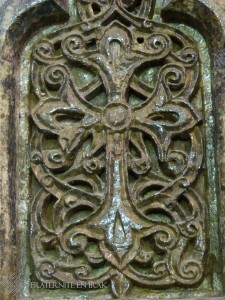 There are a number of inscriptions from 1146 and another group from the thirteenth century. One of the inscriptions from the year 1146 refers to a rebuilding which seems to suggest that the church and the octagonal mausoleum were earlier. Could you explain the political and cultural context surrounding the building of Mar Behnam mausoleum and church ? Due to its location along a number of trade and migration routes, Mosul has always been a major cultural center. In the medieval period, control of the region passed from the Seljuks of Iran to various Turkish and Mongols rulers. These different rulers connected Mosul to other regions in Syria, Anatolia and Iran. For much of the thirteenth century, Mosul flourished under the control of the Atabeg Badr al-Din Lu’lu’ (Mamluk ruler of Mosul until 1259, he was a great innovator. He protected the city from destruction through tactical submissions in particular to the Mongols Overlords.). He was known for his extensive building programs. His rule marks a period of unprecedented prosperity for Mosul, especially for the Syrian Orthodox Church and other Christian populations in the area. The Mar Behnam monastery marks a place associated with a series of miraculous cures. The church and mausoleum are devoted to the martyrs, Mar Behnam and Mart Sara, who died at the hands of their father for following the Christian faith. Although Mar Behnam is a Christian saint and the buildings have always been in Christian hands, it has been sacred to both Muslim and Christian visitors since the thirteenth century. In term of art history what makes Mar Behnam a unique place in the Middle East ? The Mar Behnam monastery has attracted the attention of art historians as an important example of Muslim-Christian syncretism. 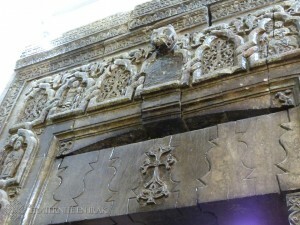 It was one of the few churches to survive the Mongol onslaughts of the second part of the thirteenth century and even before the catastrophes of the last few years, Mar Behnam was recognized as the most complete example of a style of architectural carving that was common throughout Mosul and its environs. 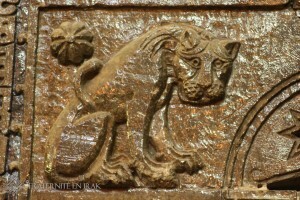 Given the tragic destruction of portals and mihrabs from most of Mosul’s medieval Islamic shrines, Mar Behnam’s architectural sculpture, though damaged and in need of careful restoration, remain the only extant example of a type of architectural carving that was found in both Christian and Islamic sites. As the extensive medieval sculptural program has been largely untouched, its reconstruction is both a crucial and delicate task. How would you define and describe the style of the art at Mar Behnam ? The art of Mar Behnam belongs to what the Dutch art historian, Bas Snelders, describes as a Muslim-Christian overlap. There are multiple similarities between Mar Behnam and contemporary Muslim and non-Orthodox Christian structures from Mosul and surrounding regions. 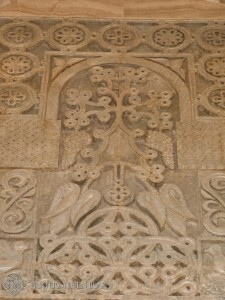 A number of sculptural reliefs appear throughout the church and mausoleum. Its carvings display a style and iconography that was so closely tied to the Islamic art of medieval Mosul, many scholars and travelers assumed that all these buildings had to have been made by the same craftsmen. The features that they noted were the deep architectural carvings. 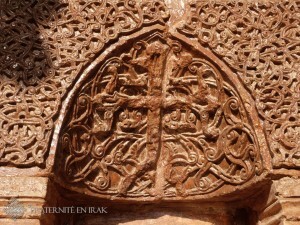 The only features distinguishing the carvings at Mar Behnam from those of contemporary Islamic structures were the inclusion of crosses and church figures to the decorative program. The period of the carvings coincides with the high point of Mosul’s famous metal ware industry, which like the architectural carvings, benefitted in form and quality by the ability of Mosul’s craftsmen to incorporate forms and styles throughout the Islamic world. What do the multiple languages carved in Mar Behnam stones reveal of the importance of this place ? The Mar Behnam church and mausoleum display inscriptions in Syriac, Arabic, Uighur (language spoken by a specific Muslim tribe from Mongolia), and Armenian. Although the majority of the inscriptions are in Syriac, the other scripts and language bear witness to the fact that the buildings importance extended to different linguistic and ethnic communities. Could you tell us more of the Uighur inscription, why is it a rare historical testimony ? 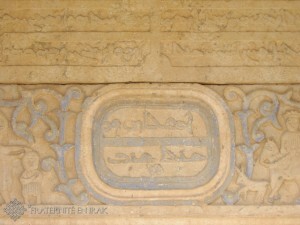 The inscription, itself, is found in the octagonal mausoleum in an area above the grave of Mar Behnam. It appears in the same area as inscriptions in Arabic and Syriac. The Uyghur inscription dates from the end of the thirteenth century and asks that the peace of saint (mar) Khidr-Ilyas rest on the Ilkhan, his nobles, and his wives. 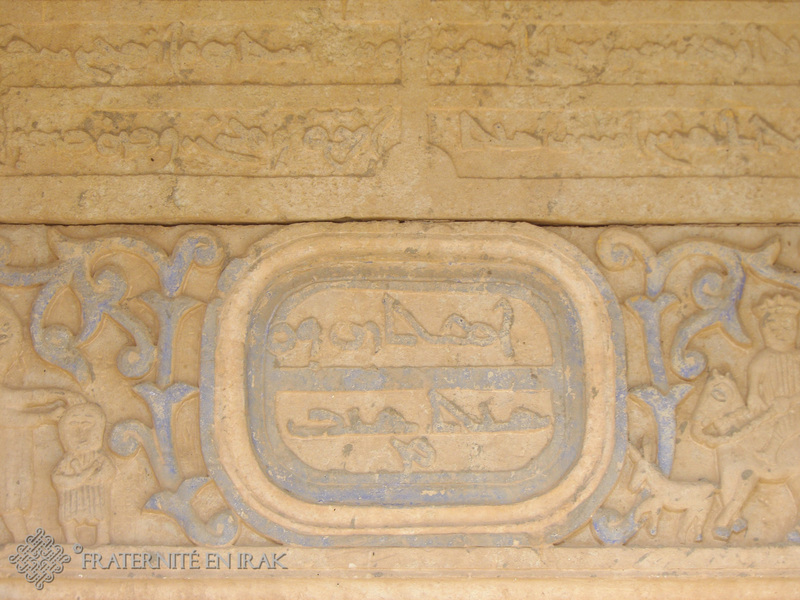 The inscription both confirmed the association of Khidr-Ilyas with the mausoleum and offered Ilkhanid (Mongolian dynasty ruling Mosul in the late 13th) protection to its continued safety. Mar Behnam is also revered as Khidr of Khidr Elias, how would you describe this holy person transcending religions ? Khidr Elias is a composite figure combining the Muslim prophet Khidr and the Old Testament prophet Elijah. Both figures have long been associated with immortality and esoteric knowledge. Khidr (al-Khadir) is a legendary figure of rebirth and renewal who has a long and enigmatic history. He is known as the ultimate companion and guide who transcends the appearance of religious difference. 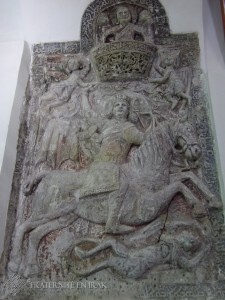 He is often associated with St. George as well as other equestrian saints who fight evil. His feasts are celebrated throughout the Middle East and he is the focus of support from Yazidi and Alawi groups as well as Muslims and Christians. He has been an important source of devotion for the people of Mosul and other parts of Iraq. 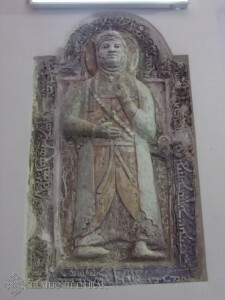 Khidr was associated with the now destroyed al-Mujahidi mosque and was said to appear at the al-Nuri Mosque. 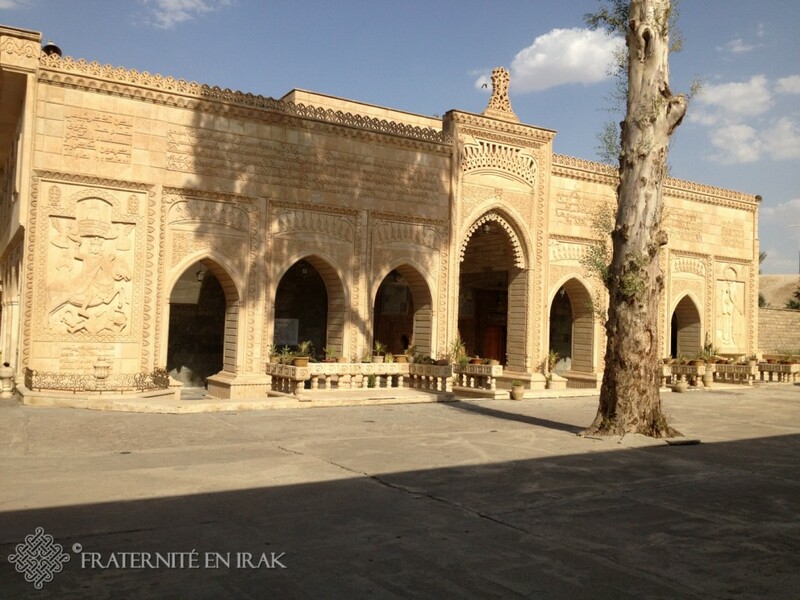 A Khidr Elias festival in Baghdad was recently added to the world heritage list. Given his importance to so many linguistic and ethnic communities, it is not surprising that so many of his sites, like that of Mar Benham, have been significant to diverse communities. How is Khidr represented and cited in Mar Behnam ? Do you know other Christian sites dedicated to Khidr ? Aside from the Uighur inscription, Mar Behnam has been known as Dayr al-Khidr and the mausoleum itself as the Maqam of al-Khidr. As such, it miraculously survived the Mongol raids that destroyed so many of the other churches in the area. Although there are still relatively few Christian sites with inscriptions naming Khidr, there are often travel and other accounts that describe Khidr being found at Christian sites. The number of sculptures representing symbols, animals and humans seems to be huge, do you know other sites of that period with such a huge treasure of sculptures ? That is a hard question to answer especially, after the destruction of the past few years. Certainly, this is the most complete corpus of this type of sculpture extant in the Jazira. There are similar uses of animals found on city walls and other structures, but the sheer quantity of those at Mar Behnam are quite remarkable. Mar Behnam also has the best surviving examples of the keyhole shaped designs made from interlocking serpents that were once found on carvings from Mosul and Sinjar as well as on metalwork. What makes Mar Behnam’s architectural program so unique is that it combines traditions from Armenian and Islamic work.